Big Aurora. Image copyright Goran Strand. 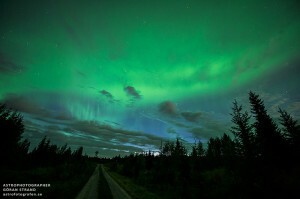 Earlier this week, the Universe Today blog featured aurora photographs taken by Frank Olsen and Göran Strand. Both photos were beautiful, but I’m in love with luminous sky in the image Strand posted on his blog last week. I’m also in love with his description of the scene: he claims that photo looks as “if a green blanket was put on top of the sky (om en grön filt lagts över vår himmel)”. This aurora is much friendlier than the goblinesque northern lights that frightened me as a child.